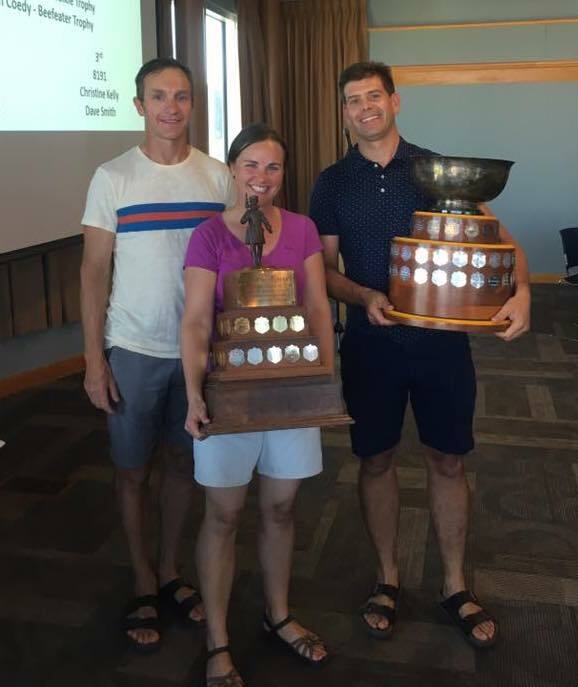 Congratulations to George and Robbin for winning another challenging 2017 regatta and to Robbin for her generously in-depth synopsis of what they did right! 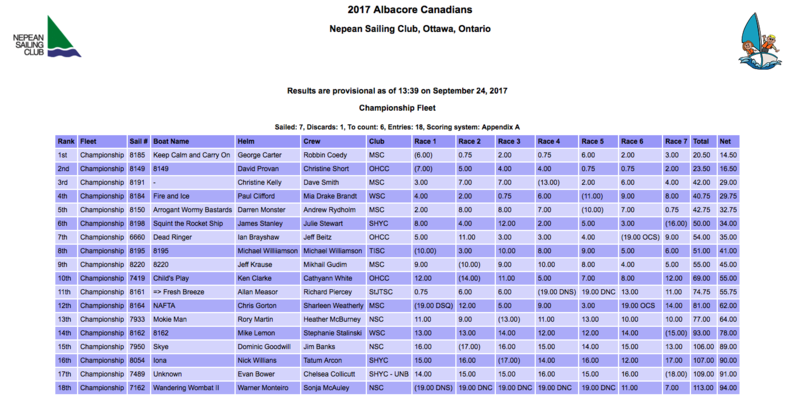 George Carter and I sailed at the Canadian Albacore Championships held at the Nepean Sailing Club in Ottawa on September 22-24, 2017. The conditions were generally light and shifty, making for close racing and a high-scoring regatta. We partnered up last-minute and hadn’t had a chance to practice together, so we wanted to arrive early to have enough time to set up the boat and get completely organized. This relaxed preparation time, which we had each day, was very helpful for me to get connected and familiar with the boat through cleaning it and checking it over, and to start each day in a good state of mind. Unfortunately, a lack of wind meant there was no racing on Friday so we didn’t begin until Saturday morning. It was another light day, and it was a long upwind to the start line. We used that time to set our boat up optimally (experimenting with the jib car positions, pre-bend, rig tension and sheet tension) and also to gather information by watching how other boats were sailing with respect to wind direction and speed. We had a discussion about the shifty conditions, and that it would likely mean the regatta would be won by focusing on consistent results and not taking a lot of chances. That time sailing to the start line was extremely important for setting up our day. From my own experience I often waste this time, and this was a good lesson to learn. Our starts were quite conservative, at the favoured end of the line but away from the crowds, we generally had clean air and nice speed. Our plan for the first windward leg was to try to be in the first bunch of boats, but more importantly to not split off and end up at the extreme sides of the course. We focused on boat speed, not pinching, and keeping an eye on the boats on the outsides of the course to see how they were doing. We sailed to the side we thought was favoured, but well below the laylines. To keep the upper mainsail leach telltale flying, we used maximum prebend almost all the time and were careful not to over-tighten the jib leach to keep our speed. As the weekend went on, since we had so much practice in light air, I became better at sheeting in the jib during roll tacks. At the beginning I was sheeting in too quickly, but I realized how the importance of sheeting on the new tack initially as if I was reaching, and to do not sheet it in further until the boat is upright to make the best use of the roll. Downwinds were long and extremely hot, and at the beginning we were not too pleased with our speed. This improved when we focused on making sure our air was clear, as wind shadows may have been more important than normal with the very light conditions in close racing. On the last day, we saw Mia Brandt standing in the boat on the runs and decided to try it ourselves – as crew, this was way better for me as I was able to see everything that was going on behind us to call the downwind tactics, and it was easier to keep the boom out in those conditions. Due to the start line being in the middle of the upwind, the second windward leg was significantly longer and we consistently used this to make progress up the fleet. We went a bit further to the sides of the course, based on what we learned in the first half of the race almost always improving our position..
Arguably, the most important race of our regatta was race 5 where we made a mistake by sailing too far to the extreme left of the course focused on one competitor – deviating from our plan – and ignoring the rest of the fleet who were all to the right of us. The wind shifted right and we ended up 13th at the first windward mark. We managed to put our heads down and gradually overtake boats in the second upwind to come back for a 6th place finish, which counted in our overall score. In the end we just did enough to win the championship, by narrowest of margins, from Dave Provan and Christine Short. Dave and Christine sailed an excellent regatta, were fast all over the racecourse, and very consistent in their results. If one or two legs had gone a bit differently, they could easily have been the champions. It was wonderful to see participation from Chris Gorton, who didn’t just drive all the way from Carolina, but drove extra distance by rounding Lake Ontario to port rather than to starboard, and also three teams from the East Coast. The effort required for them to travel to Nepean was really appreciated. 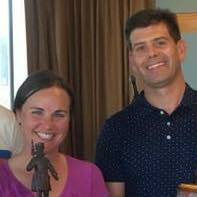 Personally, I have not traveled to many out of town regattas and wasn’t planning on doing Canadians this year, until I had a lovely time at the North Americans in Kingston a few weeks ago. Traveling to sail seems like a daunting prospect for people who are relatively new to racing but the reward of the experience – time on the water, getting out of town for the weekend, and mainly from getting to know our fellow sailors better – is something everyone should try. With the 2019 Internationals coming up at the first place I ever traveled to for sailing – Shelburne, Nova Scotia – I hope the sailing community in Toronto makes a great effort to encourage sailors both old and new to travel for a wonderful week of sailing. As the Commodore of Mooredale Sailing Club, I’m already thinking about how I can get as many of our club boats as possible participating. Thanks so much to everyone who made this an excellent weekend, including Dominic Goodwill, all of the Nepean volunteers, the band on Friday and the racers from near and far. 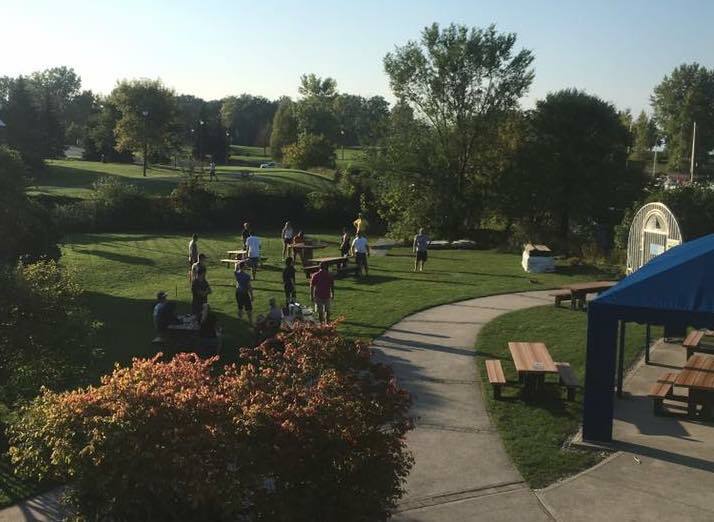 Their efforts make our events not only possible, but also really enjoyable. The hospitality we experienced at Nepean Sailing Club was outstanding and I’m looking forward to next time!